An introduction to roof calculations. Finding the lengths and angles of the roof members. I think that roof calculation is passing out of the hands of carpenters and builders, and over to the truss manufacturers, and structural steel draftsmen. From my point of view here in Australia it seems that the current crop of carpenters would have a less than perfect idea about rafter cuts and roof bevels. They may have a vague memory of a few hours of trade school instruction, but they don't need it for fixing trusses. On a modern steel roof, except for the most simple, the average small welding shop will steer clear of many jobs because they see roofs as not being their trade, and the cost of detailed shop drawings is too expensive. This is a pity and I think that a knowledge of how roofs are put together is an advantage to many involved in building work. The average general contractor/builder, tradesman, metal fabricator or DIY owner builder will gain enormously by learning the ins and outs of roofing calculations. 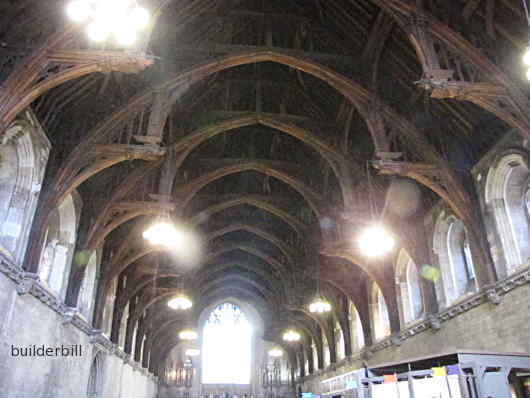 Westminster Hall Hammer Beam Roof. Span 68 ft., length 238 ft. the ridge is 90 ft. 6 inches above the floor. Built in 1385 without the help of any modern gizmos. Roofs are all about right angled triangles and solving them. There are two basic methods that I use. Drawing and a scientific calculator. In most cases the imformation provided to build the roof come from a drawing and a specification. I was taught roofing by drawing the roofs to scale, and I recommend it to anyone. The actual process of making a drawing, be it a quick thumbnail sketch, a drawing to scale on a piece of ply or a CAD drawing using a computer seems to somehow to fix the details in ones mind. Don't underestimate the value of the prevous point. Even if you get competent with a scientific calculator, a quick sketch can help to clarify your thinking. Every roof ever built before say the computer age has been built using drawing techniques. From drawing full size to drawing to scale. Drawing to scale can be remarkably accurate. Many times I have done quick quarter or one fifth scale drawings on an old sheet of ply on site and then checked my lengths with a pocket calculator. In every case my figures from the drawing were accurate enough to start marking out and cutting. In cases where there was something wrong then invariably the mistake was in the calculator input. First off work from basics. Learn how to do it yourself. That is learn to draw it out to scale. Learn to recognise what is a flat surface, what is a right angle triangle etc. Understanding roofing is all about geometry, that branch of maths that we all did at school and most of us thought we would never need again. If you find my explanations a bit hard to understand, Google "geometry" and start from the beginning. All you need are the basic drawing tools, a square, a straight edge, a sharp pencil and a steel ruler. What to draw on? I like MDF cover sheets that I buy cheap. I have also used bits of ply, old doors etc. Set up in the shade on a couple of saw stools and you are on your way. Don't rely on some website's fantastic roof angle calculator or buy a specific pocket roofing calculator or get a little book with all the magic secrets in it. Why not? Sooner or later it won't be there when you need it. You will be trusting someone else's calculations. Look at the disclaimers these things have, they won't pay for any stuff ups. A lot of these so called aids, and here I include the steel square also, will take a bit of time to master. Why not invest that same amount of time in learning how to do it for yourself? Once you learn the basics of roofing, by drawing it out, it is very simple then to progress on to doing quite complicated stuff that NONE of the gizmos can handle. When you have the basic knowlege at your finger tips and you have a feeling and grasp of where the various triangles sit in a roof, then get yourself a cheap student's calculator and you will be in charge. You will be able to solve any roofing problems. Any where, any time. In the next few pages I show you in detail how I tackle roofing calculations, from simple to what may seem to you now to be complex, but in actual fact they are easy. Believe me, it's not rocket science.